Is that your super power? "I think I have worse hangovers than normal people." "Is that your super power?" This is a painting I recently bought. Obviously, it's Mister T fool. It was made by a nine year old named Levi. He's pretty cool. 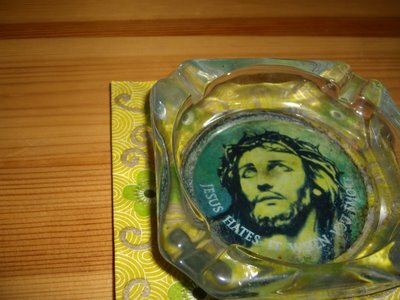 Jesus hates it when you leave the novelty ashtray you bought for your smoker-friends out in the rain for five and a half months. I know him... and he does.